Let's face it. The beard is back! #FearTheBeard #BeardGang are hastags you commonly see on various beard posts on Instagram. It's now all about how long and thick your beard can grow that defines the man. In growing out your beard it's important to have your beard look fresh and healthy. GIBS Beard oil offers 3 different types of oils which all have the amazing healing properties of Argan oil which naturally softens, feeds and nourishes the beard. Argon oil also gets rid of that dry and brittle feel of your beard as it grows. Olive and Sunflower Oils to nourish and strengthen the Beard. Copaiba Balsam helps prevent break-outs and diminishes bumps and Passion fruit Oil protects against beardruff. Gibs Beard Oil fragrances smell clean and masculine with each oil using a variety of scents such as sage, cedar, tobacco, cognac, sandalwood, saffron, cinnamon and leather. Bush Master Beard Oil contains rich moisturizing nutrients from Passion fruit and Argan oils soften your scruff while an adventurous fragrance of Grapefruit, Tobacco flower, saffron and cedar spice up your life. Copaiba Balsam helps prevent break-outs and beard ruff while Sunflower and Olive Oils heal and condition. Voodoo Prince Beard Oil Besides has the amazing healing properties of Argan, Olive and Sunflower Oils to nourish and strengthen your mane, this amazing oil has a spell binding fragrance with hints of Bergamot, sage and sandalwood. Copaiba Balsam helps prevent break-outs and Passion fruit Oil protects against beard ruff. Manscaper Beard Oil is good to protect your beard and the baby face beneath with our amazing formula of Sunflower, Olive and Argan oils. They'll soften and manage your mane, while Passion fruit and Copbaiba Oils help prevent acne and other stuff from invading your brush. A manly scent with hints of cinnamon, leather, vetiver and musk will leave 'em wanting for more. 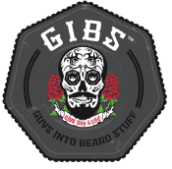 Gibs Beard Oil Retail Price is $19.99 with Free Shipping.